The influence of social media in modern society is no secret. In just a few years, it has boomed over the social landscape and into the lives of people all over the world. The most popular site, Facebook, now counts over two billion active monthly users (DreamGrow) including 79% of online American adults (Pew Research Center). And Facebook’s influence is not alone, communities are increasing in size all over the board. Instagram now has over 800 million users, over 500 million of whom use it daily (Instagram), while in just a few years, Snapchat has amassed over 165 million daily users (Business Insider). With social media becoming so popular so rapidly, companies have had to adapt quickly to reach customers in this new landscape; one of the popular trends is influencer marketing. In this strategy, companies use social media personalities, namely on Instagram, to promote their products rather than using traditional ads. By doing this, the businesses hope to make their pitch seem more genuine to their target market. This is especially crucial to reach younger generations with reportedly only 1% of millennials trusting the products they see in traditional ads (Huffington Post). While in the past much of the social media stars could be persuaded into promoting a brand through merely free products, influencer marketing has become a huge cash enterprise, especially for profiles with large followings. 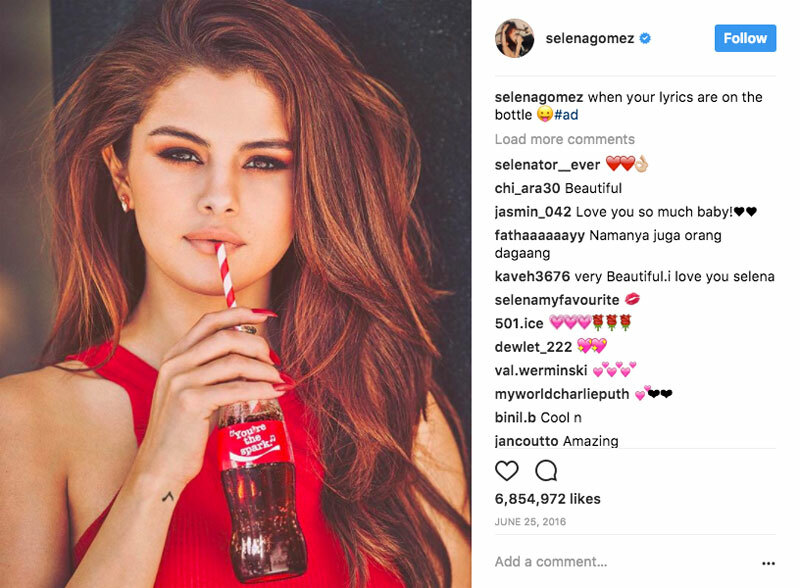 Selena Gomez with 122 million followers, the second most followed Instagram account after Instagram itself, reportedly gets paid $550,000 per sponsored post. The second highest earner, Kim Kardashian, receives half of a million dollars per post, such as the one below (Hopper HQ). However, the profiles brands choose to advertise through also do not need to be celebrities. These so called influencers, non-celebrities with a large social media following, not only cost less to advertise through, but their posts can also seem more genuine to their followers than that of celebrities. However, the most popular influencers can still run up a hefty price tag. For example, a post from Huda Kattan (@hudabeauty) will cost around $18,000 (Hopper HQ). Despite the price, 84% of surveyed marketers plan to execute at least one influencer marketing campaign in the next year (Forbes). So why are companies so willing to spend so much for a picture that will only show up on a user’s feed for a few hours before being lost in the sea of content? As stated above, younger generations are becoming more and more distrustful of traditional advertising; and with the endless material on the internet, ads are easily drowned out. In contrast, people do not only pay attention to posts by social media stars, but can actually enjoy them. For example, the ad by Selena Gomez pictured below racked up 6.8 million likes and extremely positive comments. Therefore, companies are paying the price for influencer marketing to make their ads be viewed in a better light. Also, because people choose to follow certain profiles markets can easily be targeted. Users with similar interests follow similar profiles, therefore, the market is naturally segmented. So, every ad is already tailored to the niche that follows the personality. The rise of influencer marketing represents the new marketing landscape. Here, brands are attempting to connect with consumers on a more personal and tailored level. What better way to do that than getting people’s idols to recommend products in a way that people enjoy. As the number of social media users continues to rise, the prevalence of influencer marketing will undoubtedly follow. So, stay ahead of the curve and incorporate influencer marketing into your overall marketing strategy.